Gourds are an easy to grow decorative fruit and a fascinating curiosity. Visitors to my house are amazed - 'they are not edible' - I sometimes have to say. Gourds appear somewhat like marrows, but with an interesting variety of forms. Large and small; shapes include: tear drop, globular, egg shape, and flattened and segmented... The suface may bear wart like lumps, but can also be smooth. Colours range from: white, bright yellow to orange, and shades of green. They may display stripes, or be divided into 2 or 3 areas of distinctly different colour - at the base and the end for example. 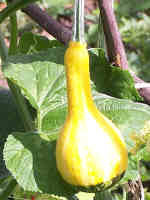 You can grow spectacular Gourds - U.K. seeds on this link. & a whole variety of - decorative fruit from seed packets available here. While some seed packets produce a particular shape, the variation in fruit from mixed gourd seeds is remarkable. I wondered if the fruit hanging from climbing stems might be affected differently from those resting on the ground. In 2006 I grew my them up a runner bean arch and over the ground. They make a good companion for runner beans. Their large leaves shade the ground to suppress weeds and keep the soil cool and moist for the beans. But as prolific growers they were also able to compete with the runner beans for light if not trained and kept in check. Sow April-May under glass. Grow in sunny bed as a half-hardy annuals. Fruit develop July-September. They don't need any special feed. But, as always, high potash will promote more flowers and fruit than readily available nitrogen. When the plants are finished a large amount of leaves and stems can be recycled onto the compost heap. Although mine grew no larger than a medium sized marrow, (certainly big enough to fill a fruit bowl), you could experiment by removing excess fruit to see if the remainder grow bigger. However, I don't advise you cut the fruits for drying until all the leaves have died down. In fact, they can be left outside to dry as they seem relatively impervious to water and resistant to rot. But when they're ready, take care to cut them cleanly with a sharp knife, leaving an inch or two of stem attached. A ragged cut can indeed lead to rotting. If it does happen it smells like rotting potatoes. Drying is a slow process and doing it too quickly will cause some forms of fruit to wilt and become mishapen. 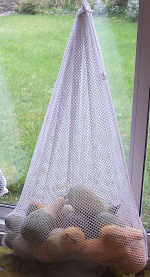 Place the fruit in a net bag and hang up in a dry airy place. When dry the fruit can be cut into lots of interesting shapes: for bird feeders and nest boxes, to contain fresh cut flowers, or dried flowers; or pot pourii, or for odds and ends. I'm sure you can think of some interesting craft ideas too. The gourd pictured here looks like a warty marrow with a bulbous end. But if you wish to improve on nature further you can paint your own designs onto the surface. But first, provide a non absorbtive surface for the paint by immersing the fruit in a liquid water-sealant. You can get more information about gourd craft products here. Find out more on building a runner bean arch here.